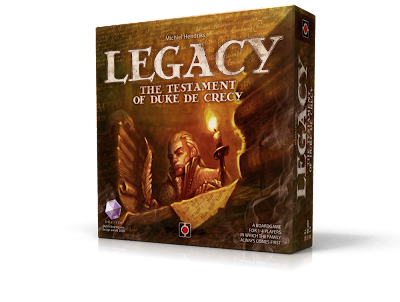 My attention was drawn to Legacy as its theme is original and it seems that each game creates a story of its own. Each player starts the game as a member of a royal upper class family. The player's goal is to gain the most honor for his/her family by marrying a member of great class and nobility; and from there expanding their family through 4 generations, with each generation hopefully bringing greater and greater honor and wealth to the bloodline. Over the 4 generations (9 rounds), players undertake actions that involve buying mansions, going on missions, contributing to society, and making important friends in the community. But the most important of the actions is marrying one of the friends you meet or arranging marriages for your future generations. From these marriages more children are born, or if you're unlucky, complications in birth takes the life of the mother or child. The players have to balance their income, contacts and prestige so that after each generation, they have sufficient means to further their family's cause and to uphold their inherited family "values" (starting mission objective). I've been tempted to preorder Legacy over the past week. I like the novel concept of achieving goals through family lineage, and how each marriage has its purpose & place in the generations that passed and is to follow. It is basically another worker placement game that requires you to acquire resources, but these resources come in the form of friends you've married and how they help you to accomplish each mission you undertake. This helps the story to unfold and gives attachment to the things you do and people that you have carefully selected. I'm still on the fence about the preorder, but it's one I would certainly like to check out when i'm at Essen.